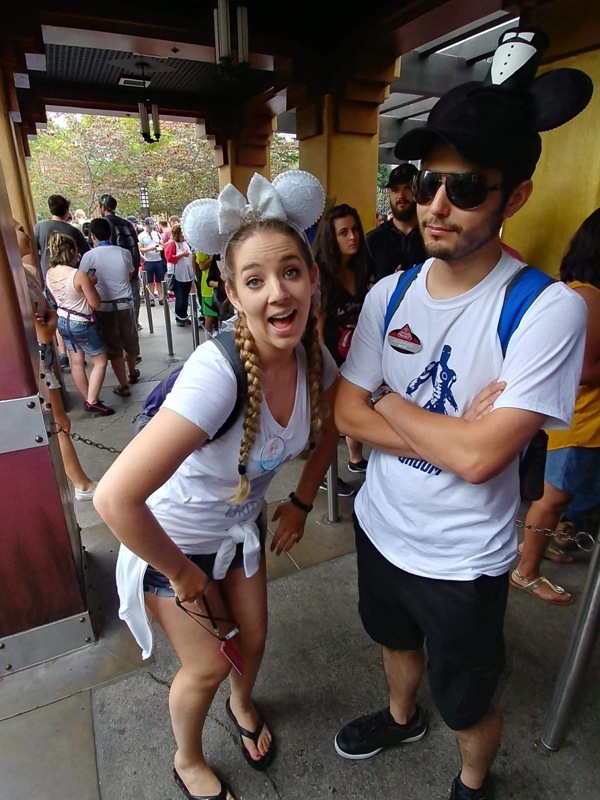 Disney Bride Laura planned an “At-Home” Disney wedding in July 2018. 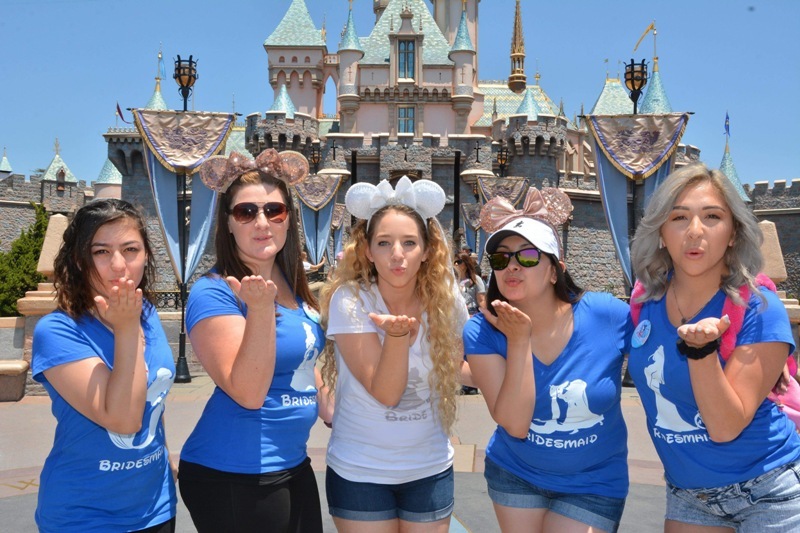 Ever since I was a young girl I knew I wanted to have my bachelorette party in Disneyland. However, my fiancé also shared the same dream. This is when we decided to make it a co-ed experience. We told our bridal party of the festivities and they all were extremely excited. Before we knew it the weekend was upon us. 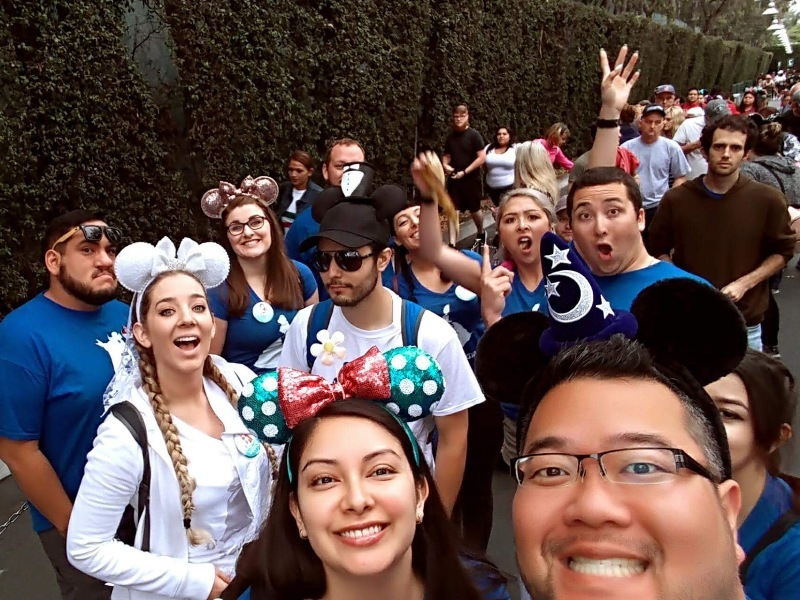 The overall itinerary was as follows – Day 1: Arrival, non-Disney group activities, and dinner, Day 2: Disney’s California Adventure, and Day 3: Disneyland. However, it is difficult to talk about everything that occurred without writing a novel. So, I will simply stick to the Disneyland aspects of our festivities. 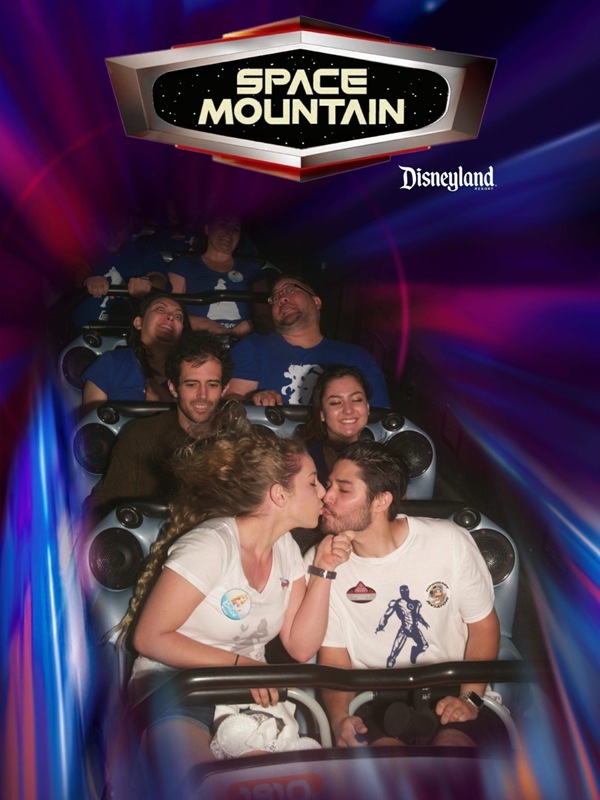 My fiancé and I decided to do two days in the parks for monetary reasons, as well as to enjoy one full day in each park. For the first day we wanted to go to Disney’s California Adventure because we wanted to end the trip at Disneyland. We also wanted to do something super special for our bridal party, so we had matching shirts made at a local print shop in our town. I also had personalized buttons made for my bridesmaids to wear from BippityBoppityButton on Etsy. Let me be the first to say that corralling a massive group of 14 people is no easy business. However, with a little finesse (and verbal encouragement), we all made it out the door and on time. Now, as we all know the crowds can become a bit hectic on the weekends (especially during summer), but we also happened to be there for the opening day of Pixar Pier. 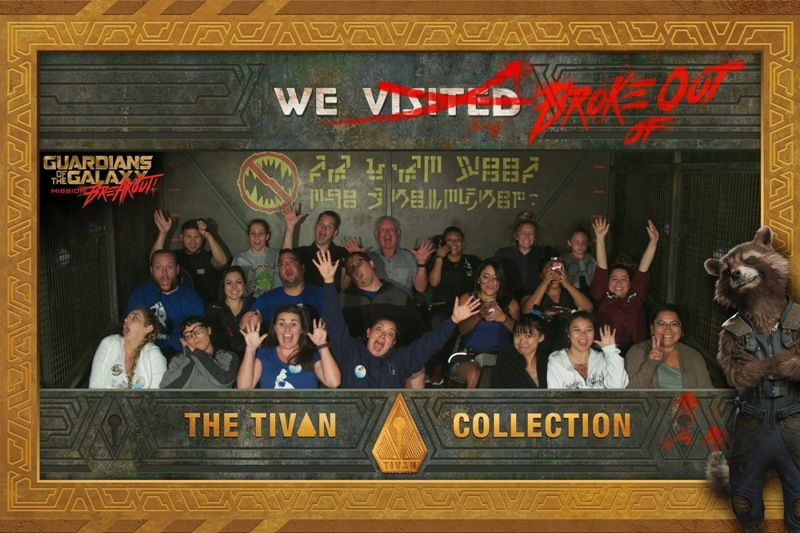 Luckily everyone in our group had MaxPass; otherwise it would have been a much different experience. 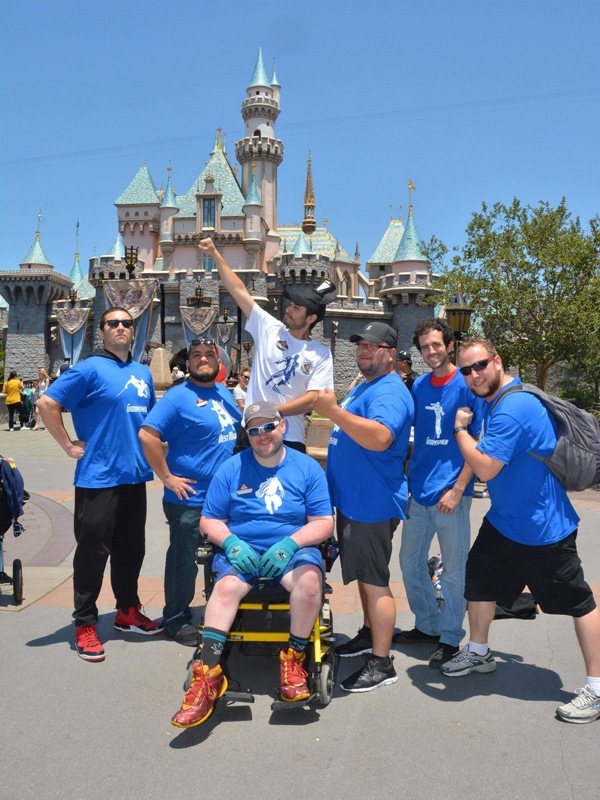 Now as a prelude, the majority of my bridal party had not been to Disneyland in many years. This means they haven’t experience the new and improved Cars Land, World of Color, Guardians of the Galaxy, etc. So this whole experience was doubly exciting. Upon arrival to the park we made FastPass plans for Radiator Springs Racers. In the meantime we perused the shops and got us some nectar of the gods (aka coffee). I wanted to start the day off with a bang so we decided the first ride of the day would be Guardians of the Galaxy. After the ride we walked through the streets of Hollywood Boulevard to head to our next ride. We could hear whispers of curiosity from stranger’s lips as they admired our matching outfits. We would occasionally receive congratulations or well wishes from those who were bolder. Maybe the whispers were about our strange way of regrouping everyone. We all made this noise that can only be described as a “mating call”. Trust me, it worked. 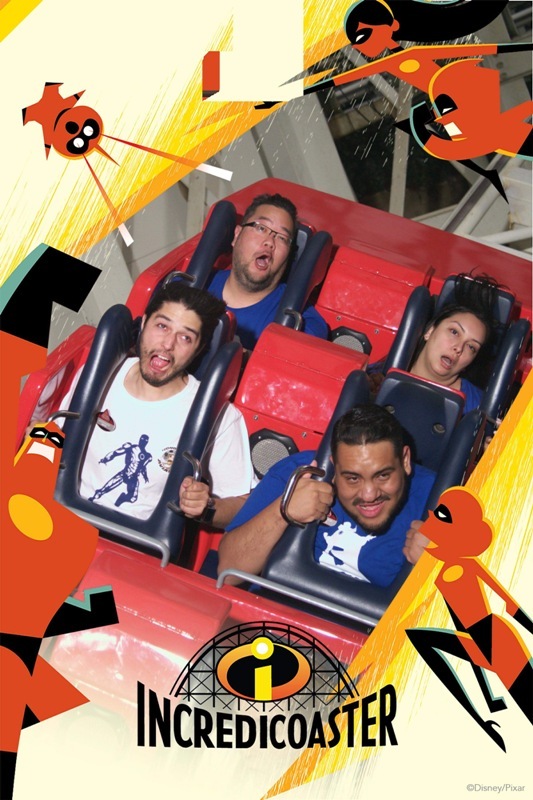 We even did it while we were buckling up on Soarin’ Over the World, just for laughs. Our next ride of the day was Ariel’s Undersea Adventure. That is where we saw the massive line for Incredicoaster that was increasing by the minute! This was to be our next FastPass Selection! 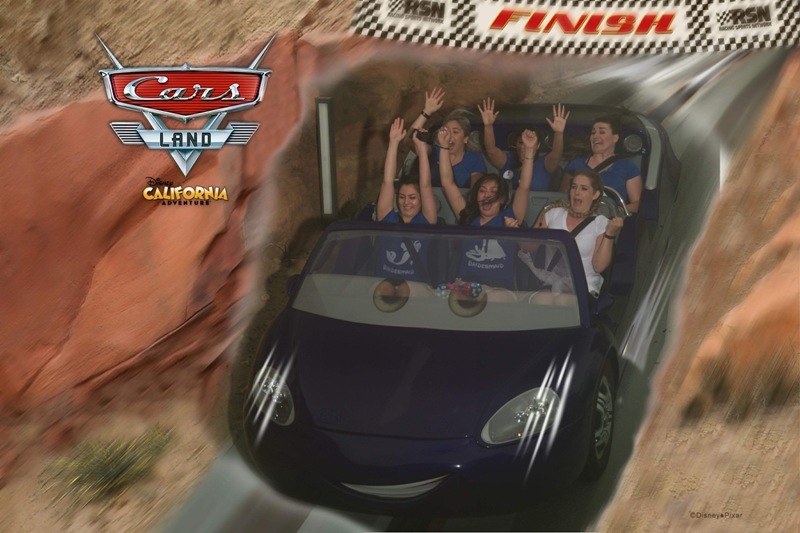 But for now it was time for Radiator Springs Racers. 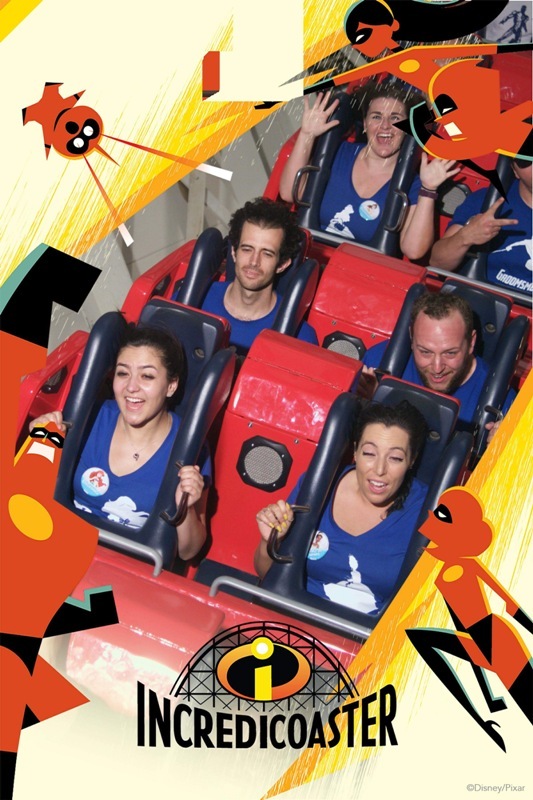 Everyone was so enthralled with the ride. We even got to race each other. It was guys versus girls and I just have to say that the girls won. 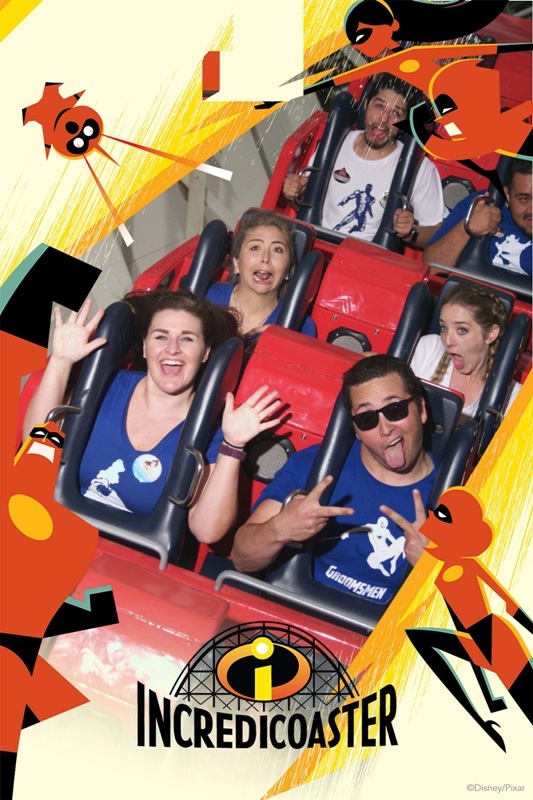 After the ride we meandered through the shops, stopped to eat lunch, and simply enjoyed our time together until it was finally time to go on Incredicoaster. This ride was so much fun with a big group. We all enjoyed the new “The Incredibles” theme. After all the rides we finally had a sit down dinner at the new Lamplight Lounge. The dinner was relaxing and the drinks were amazing. To end our first night we watched the “Paint the Night” parade before heading back to our hotel to rest up for the following day’s finale. On our last day we went to Disneyland. We again wore our matching shirt and buttons (after a mini-rinse). We planned our first FastPasses for Space Mountain. During our waiting period we went to take pictures in front of the castle to record this momentous occasion. After the ride, we went in a couple shops and while we were there a little Disney magic occurred. One of the Cast Members gave me a free Cinderella shoe pin. It was so sweet! We then ate some lunch and relaxed. Once our bellies were full we went on Indiana Jones Adventure, Pirates of the Caribbean, and The Haunted Mansion. However, the true hilarity happened later on Splash Mountain. We again decided to do guys vs. girls. 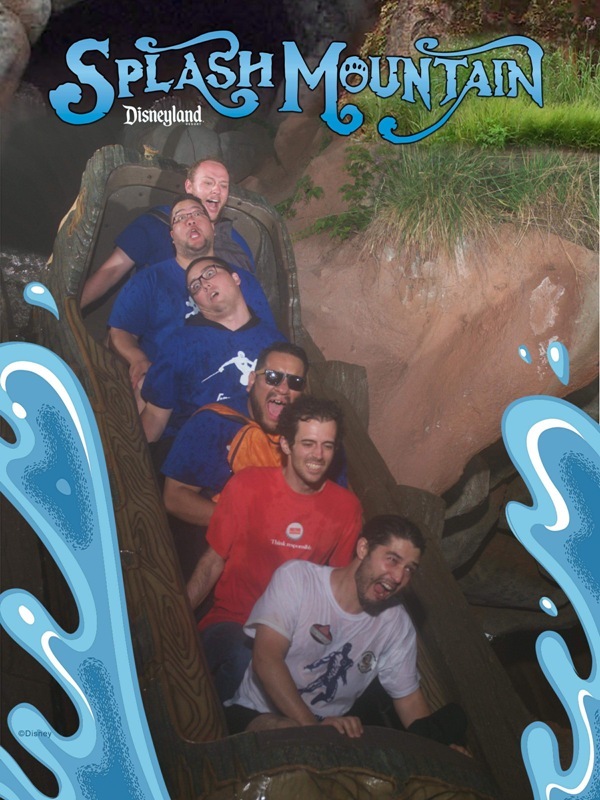 Due to the amount of … ahem … increased volume in the men’s log, the person sitting in the front (my fiancé) got completely soaked. The girls got very wet as well, but as you can see in the photo his white shirt was completely see-through. Needless to say he definitely cooled off. Before we knew it the evening was upon us. We watched the fireworks and finished with Fantasmic! The Pixar “Together Forever” fireworks were very nostalgic and both were a nice “Kiss Goodnight” for the entire trip. We did, however, go on a couple more Fantasyland rides after the shows before heading home. We received one last bit of magic before completely heading out: free Mickey and Minnie Mouse cake pops. A kindhearted Cast Member gifted them to us for celebrating our Happily Ever After. I can honestly say that this bachelor/bachelorette party absolutely exceeded all expectations I had. It will forever go down as one of my most favorite adventures at Disneyland.